Don't suffer in the cold. Just open one of these Pocket-Size Heat Packs and get toasty! They're all compact and safe. Activated when opened. Just use them for hours and then toss them out. Heats for up to 24 hours. Heat Factory Large Warmer Heat Packs, 20 Pack is rated 4.6 out of 5 by 19. 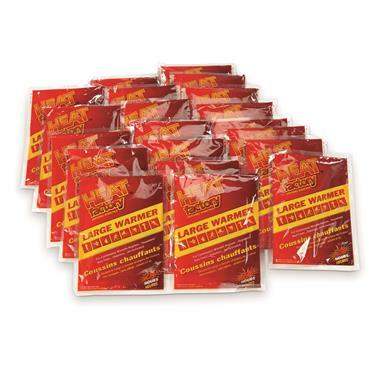 Rated 4 out of 5 by victor 223 from 24 hour hand warmers I reviewed this item about a month ago. I gave it a poor rating. I've had a chance to reconsider my opinion. This is a very good item. they will last 24 hours. They just don't get as hot as to what I am used. clean heat. Rated 1 out of 5 by Bill from Did not work I use various different brands of heat packs for hunting, first time for this brand. After following user instructions, open,shake, and stuff, they simply did not work. I gave Heat factory hand warmers ample time to activate and nothing! Of course as an outdoorsman I was prepared, I opened a different brand and twenty minutes later HEAT! Hand warmers and heat items in my book are survival tools and these don't perform. On a different hunt that was much warmer, I didn't want to be hasty about an opinion I figured second chance. I opened multiple packs, shook them and nothing. Just extra weight to pack into the field. Rated 5 out of 5 by LARRY from great price.. used them for years. Spring and warmer weather now but I like to keep these handy. Always a change in weather when you cant beat not having some. Rated 5 out of 5 by ARTHUR from Better to have them on a cold day than not to have them. Price is fair so using them more frequently isn't a drag. Rated 4 out of 5 by MICHAEL T from They work well.